Hundreds gather outside Prime Minister's Residence in Jerusalem demanding that he 'take responsibility for past crimes' relating to mass state-sanctioned kidnappings in one of Israel’s most controversial chapters in history. 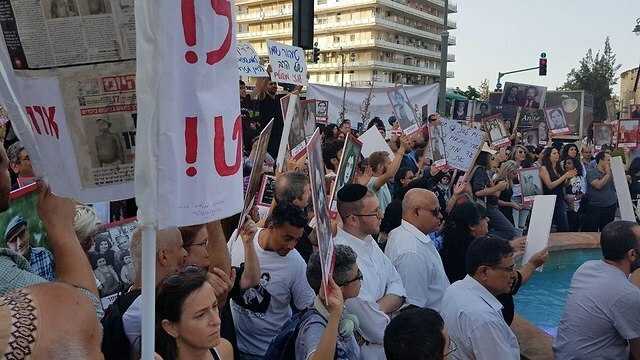 Hundreds of people demonstrated Thursday afternoon in Jerusalem ourside the Prime Minister's Residence demanding official recognition of the abduction of Yemenite, Mizrahi, and Balkan Children during Israel's early years. The protesters, who did not first coordinate with the police, started marching towards the Prime Minister's Residence on Balfour Street after blocking the Paris Square from all directions. The disappearance of Jewish Yemenite children returned to headlines in 2016 after several NGOs demanded the state uncover archival materials related to the affair. The government authorized the release of such materials, which were originally meant to remain classified until 2070. Hagit Aharon, another protestor, shared her personal story. “I was born in 1986 in the Kaplan Medical Center. My twin sister and I were born premature so it was decided to transfer us to the Wizo Hospital in Tel Aviv,” she said. “After three days we were told that my sister has died. When I was 18 years old my mother received two draft orders and a phone call from the military demanding to know where her two daughters are. She told them that one is doing national service and the other died," Aharon recalled. "Immediately the call disconnected. That was the moment we started to realize that something suspicious was happening. Today we’re waiting for a miracle that my sister will walk into our house and say ‘I’m back’. We don’t have time to wait. If she was Ashkenazi, you would’ve woken up a long time ago,” she vented. Another woman also raged at the incidents that had befallen her as one of the children involved in what became one of the most controversial chapters in Israel's history.